1. - Will this fix affect performance? No! This fix forces the PC to treat the drives as internal drives, therefore, this setting will disable any quick removal options. 2. - Why doesn't this work on my Windows 8 PC? This fix is ONLY for Windows 7 users, it is not intended, nor, written for Windows 8. I would like to take this time to thank all of you for coming by to OCN! I hope you find more answers from fellow Gamers and Overclockers! I have a ASUS Sabertooth X58 motherboard, this also has a Marvell SATA 6 controller. You just need to go into your Device Manager to turn off the "Safely Remove" function. 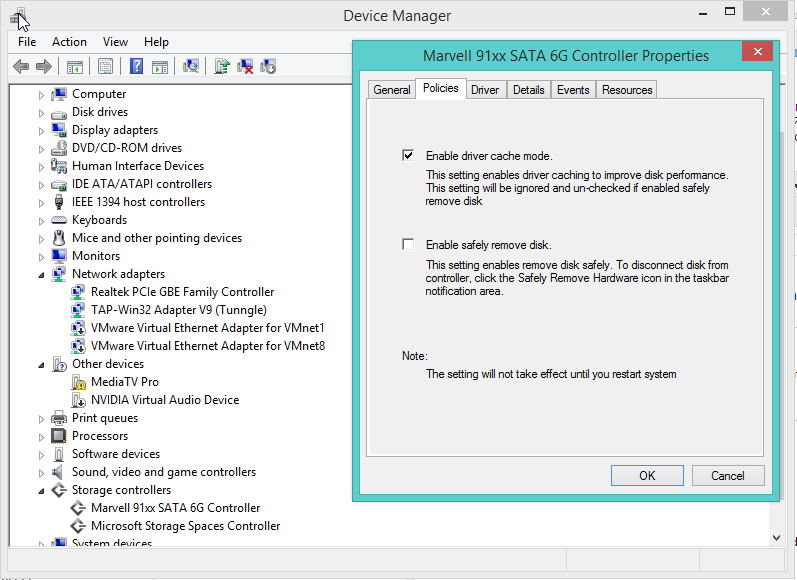 Open Device Manager, open Storage controllers, then just right click "Marvell 91xx...", choose properties, then go to the policies tab, and uncheck the box "Enable safely remove disk." I would then reboot, to see the change. - Add a new string value with name "EnumPropPages32" and Value Data "mv91xxm.dll,ESATAPortPropPageProvider"
thanks for the resurrection love, and the revamping for the new generation! A big thank you from a new user! So I was in the same boat as others here and the registry tweak was not working for me. Like another poster earlier, I too have an AsRock Z77 motherboard. Thank you. I tried the OP but it didn't work for me, maybe because the Extreme 4 has the two Sata 3 ports that I'm using listed as A0 and A1? IDK, either way thanks for the post. OMG I've been pulling my hair out for 6 hours now trying to get my 10 drives off the remove list. You sir win the internet! EDIT: This solution killed 2 birds with one stone. I had 10 drives with code 10 error under device manager/portable Devices, because they were mounted as ntfs mount points instead of drive letters? They are now gone, I am error free! Thanks again! Hi mate..The fix you mention didn´t work for me =(..I did your workaround on windows 7 and it worked like a charm..I formated my SSD to w8.1 yesterday i did your fix but it didn´t work =(.. It is still showing as removable disk. 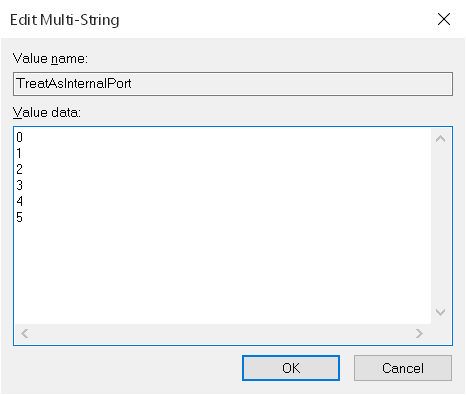 PS: I read what u wirte that this isn´t for w8 =(((.Thanks anyway..
Add a new "Multi String Value" called "TreatAsInternalPort" (no quotes). I guess you could edit this "TreatAsInternalPort" entry to exclude any ports you may want to eject in the future. I ordered a second 840 pro, had to move some stuff around "sata port connectors". As my board only has two 6GB/s and the rest 4 are 3GB/s. I've got a marvel raid card 91xx, had to switch a sata III 6GB/s hdd to the marvel raid card, cuz my two 840's are gonna be on my intel chipset as raid in sata 3 . This solution works perfect, Thanks! Ok, I tried this and it does not work. I followed exactly and rebooted. I am in RAID mode through UEFI. WIndows7 x64.